The plush genre of opera remains a mystery to some in the Fort Worth area. Which is astounding given the fact that the Fort Worth Opera has been right in their midst since 1946. If you are one of those who has not yet stepped into this magical realm, I encourage you to attend at least one of the offerings of the Fort Worth Opera Festival. Most performances are in the Bass Performance Hall, however, the McDavid Studio is where one smaller opera will be performed. Well, I love my pop, but that day I stood up to him. “It’s not screaming, and it takes a lot of hard work to learn that music!” Back then I was only beginning to stick my toe into the domain of the classical voice but I was already hooked. My hardworking father had no exposure to this genre of the performing arts. He played the harmonica by ear and my siblings and I all sang... we all loved music but the majority of it was country western, folk songs or polkas. Nonetheless, as I left cornfield land and met people around the world I crossed paths with many farmers, lawyers, retired military, or accountants who simply can’t get enough of opera. 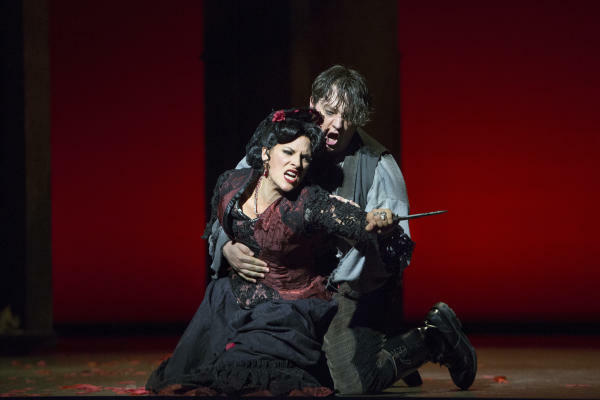 PC: Mezzo-soprano Audrey Babcock as the fiery femme fatale Carmen; Marty Sohl, Fort Worth Opera. So what draws so many regular non-musicians to take in this performance art of theater/drama/music that is, opera? Here are some sentiments expressed by people I’ve encountered who are smitten by the genre. Bob: I simply go for the chance to escape into another world for a few hours. The more entertaining and lavish, the more I enjoy it. Barbara: The whole package. The drama, the gorgeous music. Lucas: …I live for those arias, but those handsome tenors and barihunks are definitely a plus. Michele: The music and singing, mainly, but I enjoy studying foreign languages, so watching operas is good practice. Paul: I’m not learned at all. I’m a beginner although I’m quite experienced in the concert hall. I come for the music and the stage show. The singing is actually the least of it for me. If it’s a park and bark job with drab costumes and set, I’m probably out of there after Act 1. ​Kenny: I think the human voice is the most beautiful instrument we have. Sue: My opera buddy is hearing impaired... and can&apos;t hear her name called out in “opera voice” behind her in the lobby. But she goes to the opera house for every show because she’s a theater tech person and loves to “see” it. Who knows what she hears, but she hears something—the music is a continuity, with luck she’s watching a visual treat, and it has supertitles in English, easier to understand than going to standard movie in a movie theater... Opera at best is “circus for grownups” – color, music, performance, telling what may be a silly story that I’m going to care about desperately in the next couple of hours even if I don’t care now. Think Cirque du Solie – I don’t always understand it and it’s forever shifting in front of me, but if I’m lucky I’ll be mesmerized by some magic that goes beyond what’s ordinary of every day. Can’t keep me away, it’s too important. Kevin: …when my viola teacher, who plays in the [Fort Worth] orchestra, tells me that something really special needs to be seen, I will actually buy ticket and go… Carmen is such a classic. Julie: It is a magical combination of singing, symphony, story and theatre. The reason that so many of us who love opera are musicians or theater people is because we learned to appreciate the amount of work and special talent that goes into becoming a world-class musician. We also recognize (worship) the composers who have made all the elements come together to create sublime beauty. And really, isn’t beauty what makes life worth living? Maryann: "Opera has been known as the “Queen” of the performing arts as it uses all of them to perform the pathos of the the story." "Opera lovers here love the passion and emotions of historical plots like the French revolution… My own family does not understand my love for serious classical music. However, college education is often the door to understanding how literature creates opera on stage. I am rich with musical experiences over a lifetime." Chris: I like that opera incorporates many arts into one. I&apos;m primarily interested in the live theater aspect. I have yet to listen to an opera CD or listen on the radio. I appreciate the &apos;without a net&apos; quality to the performances. I like Regietheater. I like good plots. I like drama. I like that actors can sing while doing this other stuff! The more opera I attend and watch the more I appreciate the breadth of the music which has increased my general interest in the music. I like taking old stories and telling them in ways that resonate in this day and age. I like mezzos! I&apos;ve always been someone who gobbled up culture and I have always, generally speaking, been an enthusiast - immersing myself in interests. It&apos;s been great fun to find something "new" to explore, which is both vast, but also has a comparatively small canon, which makes it seem like a reasonable field to learn. … And despite spending 25 years working in publishing, I know the field of literature is so vast that one can hardly have both broad and deep knowledge - there is just too much out there. Opera seems like something I can enjoy and also learn about much of it. 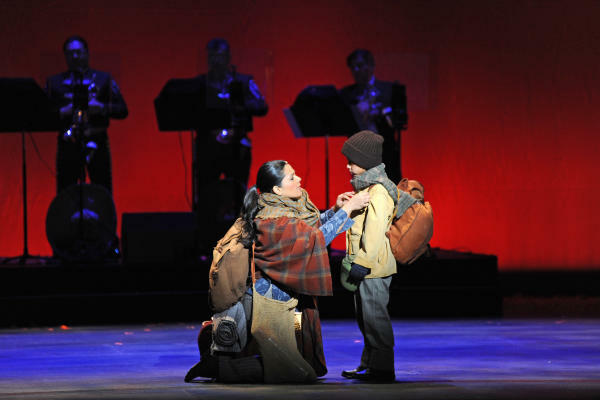 PC: Cruzar La Cara De La Luna: Photo by Tim Trumble, Arizona Opera. Jacqueline: I go because even though most people would suppose opera is all artifice, it’s where I find what it real—real talent, real glamour, real truth. I’ve been to enough concerts where I doubt any real singing is occurring. Allan: The vibrancy of the human voice, live and close-up (which is where I sit). Jim: The voices, the voices, the voices. Nothing is more beautiful than the operatic voice. Charles: I started going to the opera about seven years ago. Of course, I don’t understand Italian so my appreciation wasn’t based on following the dialogue. But I’ve been going to see Shakespeare for years, and I can’t always follow those dialogues either. "But opera still allows me to follow the story without understanding the language." 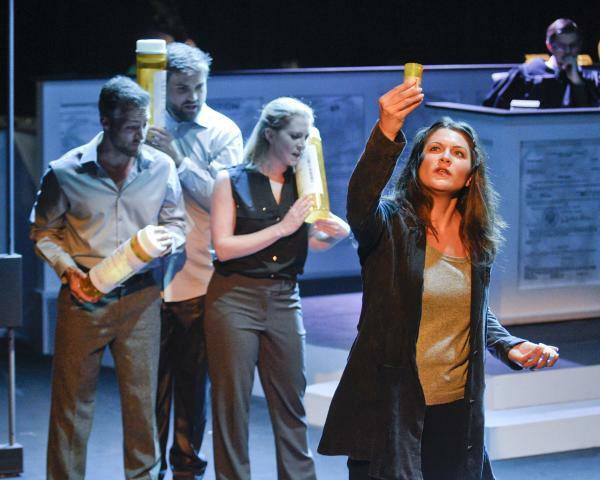 PC: Christina Pecce as The Mother’s Ghost with the cast of Voir Dire; Karen Almond, Fort Worth Opera. 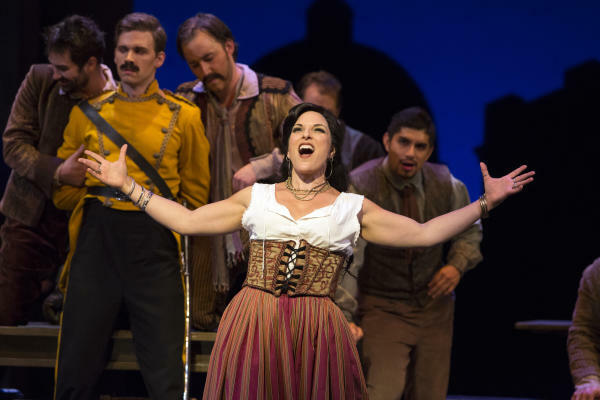 So… after reading all those testimonies, my dear DFW residents I hope you may be convinced to allow the Fort Worth Opera Festival to carry you through the beloved operas of Bizet’s fiery Carmen, the true-crime opera of Voir Dire and the groundbreaking Mariachi opera Cruzar La Cara De La Luna. Prior to each opera is a 30-minute lecture, and operas in other languages will have the translation in supertitles above the stage. The program and the website have the synopsis to give you a heads up on the story of each opera. Each performance packs the potential to wrap around your soul via passionate musical moments depicting hot romance, justice in the court, and a family’s struggles when divided by borders.